Drinks Would You Drink A Cappucino Made With 24-Karat Gold? Would You Drink A Cappucino Made With 24-Karat Gold? You could call it the money shot. 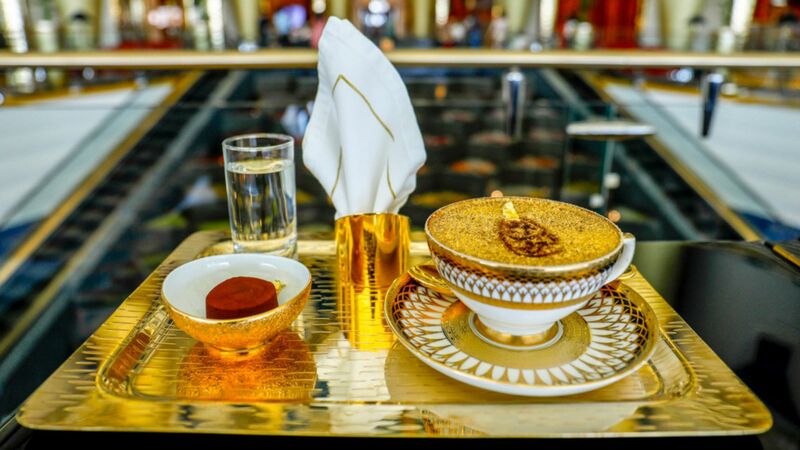 The Burj Al Arab hotel, famous for its sail-like silhouette across the Dubai skyline, has created "The Ultimate Gold Cappuccino" at its atrium café, the Sahn Eddar lounge. Along with blending "a generous quantity" of 24-karat gold into the espresso, the drink is then topped with Italian gold flakes and embellished with the trademark sail-like design on the cappuccino foam. The drink is paired with a chocolate marshmallow, also sprinkled with a shower of finely-milled gold flakes. The mid-afternoon coffee break set is served on a fine-bone, gold-gilded china in keeping with the theme. Though bougie, indeed, the Ultimate Gold Cappuccino is not completely out of the regular Joe's reach at US$26.